Betfair Acca Edge - Learn how to use it best and try it out with £30 free! What is Betfair Acca Edge and how can you benefit from it? Betfair has recently launched another innovative new product, known as “Acca Edge.” In this guide we explain what it is and how it works. Furthermore, if you do not yet have an account with Betfair sportsbook, we can offer you an exclusive Betfair sign up deal that gets you started with £30 from your first ten quid deposit. Although you can’t use this extra cash with Acca Edge, you do get a great boost to your starting bank with this generous offer. Try it now with £30 free to get you started! How does Acca Edge work? The main premise is that you get your money back if a single selection of your accumulator bet lets you down. So you can see that with Betfair Acca Edge applied to your selections, the potential winnings are slightly smaller. But if, as in the example, one team lets you down, then with Acca Edge applied, you would get your £10 stake back in cash. The reduced odds are essentially the cost of insuring your bet against a single team letting you down. 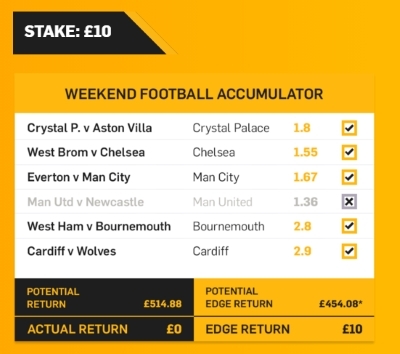 For each accumulator you place, you can tick the Edge box and Betfair will show you the possible returns, making it easy to decide whether it’s worth having or not. Are there any Acca Edge rules to be aware of? Can be used on all sports and markets, including in-play markets. No staking or odds limits to qualify. Essentially, you can use it on almost anything, stake what you like and pick whatever selections you want! Now that’s definitely betting as it should be. Perhaps the key thing to understand with this is that the way the odds change will be highly dependent on the games or selections you have chosen. If for example, you choose a massive outsider in your acca, you will note the biggest change in the odds with the Acca Edge insurance policy on. This is because of two factors relating to the outsider – it is hugely increasing the price of your overall accumulator, but it is also most likely to fail to win. When you insure against one selection failing, it will be this outsider that carries the most weight into the calculation. Actually, if you really fancy the outsider, you might well be better off without ticking the box. Otherwise, you should be asking if this outsider really should be part of the bet at all? The next best thing you can do with Betfair Acca Edge is simply have a play with it. Once you’ve chosen a minimum of 3 eligible selections you will be able to tick the box and see how the odds change. Try adding / removing different selections with different prices to see the impact of it. You’ll soon get a feel for how it works and be able to fine tune your selections to make the most of it. Finally, remember it for what it is – an insurance policy. Every time you are using it you’ve lost out on the acca as a whole. You might have a tenner back in cash, but you’d much rather you’d picked all the winners! So your ultimate aim should always be that it doesn’t come into play – consider this carefully when you’re debating that one extra risky team for your accumulator. We regularly get asked if Acca Edge is the same as Acca Insurance? Short answer – no. Longer answer – Acca insurance is an old offer that Betfair did a few years back. It’s no longer valid, we’ve now got the Edge product in it’s place, and it’s certainly an improvement for you the punter. Having said that, although the name is different, the new product is also an insurance policy, it’s just a better one! Good luck betting with Betfair, let’s hope you can continue to pick the full complement of winners and that this never actually comes into play. On the odd occasion it does though (and in the recent times of crazy football results it is going to happen), you’ll be happy to get your stake back! You can read more about Betfair on our Betfair promo code page.